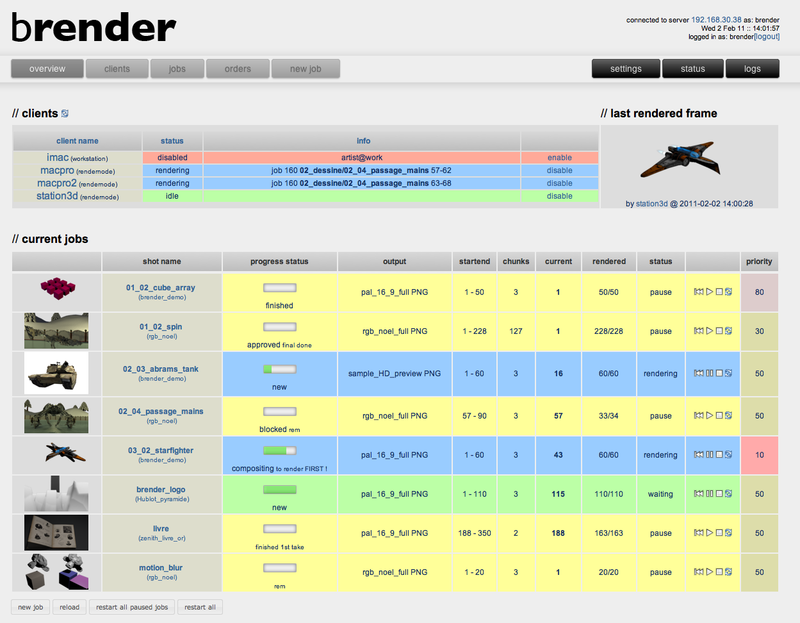 Brender is a new Blender render queue manager. The developers are looking for testers. We (Francesco Siddi and myself) have just released the render queuing system brender as open-source project. It was first written in 2005 when I needed a simple render queuing system built around blender. The system is an apache/php/mysql server running a script and dispatching the different render orders to client machines. There is a web interface for managing the projects, job, clients and orders. It has a slightly more complicated setup time (due to some paths possible confusion) because it allows scene files (and all the dependencies) to be on any machine in the local network, not necessarly on the server. that looks really nice. will try it out later! Looks cool for small companies where during the day people work on their computers. Also the help in showing the actual png sequences look nice. I'm not so sure that the status thing is helpfull. I guess it could be if the render repository is the only repository in the company it could be. It would be super if somebody wrote a python interface to the sqlserver to add projects from blender, because blender already knows stuff like start/end and screensize etc. As i'm managing my own php sqlite render dispatcher ( blade render ) I know you are releasing a ton of work here. we already had the idea to develop an addon, to add jobs directly from blender. Recently I did not succeed in letting blender/python talk to mysql ... i will keep working on it. Haha! Wrote a very similar bit of code around the same time with exactly the same name with a mate. We had a web front end with python clients. The idea was to leach my mates spare computing cycles when I had big projects to render and what better way than the interwebs? I stopped development on it cause Burp looked more promising and the possible security issues of making a public system using the model we had were way too hard to bother with at the time. Yes,...i can imagine a single application server/client including blender-aid and Brender...a dream ?!!! we already had the idea to develop an addon, to add jobs directly from blender. Recently I did not succeed in letting blender/python talk to mysql … i will keep working on it. You can have python post a form to a php web page and let the php talk to the mysql. If you want some messy code for it download the submit.py from my br site. I looked this over the other day when I saw a post about it on blenderartist.org as I will be needing a render farm soon. Needing Apache, MySQL, and PHP, to use this is just a bit much for me. I've used Farmer Joe in the past, it's one python script and one complied perl script. Never used Loki render, but from what I understand, it only requires Java. I like the fact that you can schedule times to not utilize computers on the network - would be useful in an office environment so other's computers aren't used during business hours. While I have used Apache before, MySQL & PHP are areas I've never ventured into before and I'm not interested in messing with them just to render. Great job on developing this and thanks for releasing it to the community!!!
" Needing Apache, MySQL, and PHP, to use this is just a bit much for me "
On osx it's 1 click ( sortof ) in the preferences. On windows you can start XAMPP and are ready to go. So I think its easier than you are presenting it here. The biggest problem with network rendering is the output directory and texture directory if the files are not packed. If you are using shared folders then all the clients need write access to the destination folder, and the destination folder needs to be named the same on all clients. This can be a hazard in mixed os enviourments. brender seems to also be a project organizer, which is handy for small studios where other people need to access the renderd images for video production. The preview is handy and the status thing is smart. Anyway. Just my 2 cents. This system + online render farm will be an awesome thing for doing serious projects! Don't forget to add load balancing in the future. That would really make everything optimal.